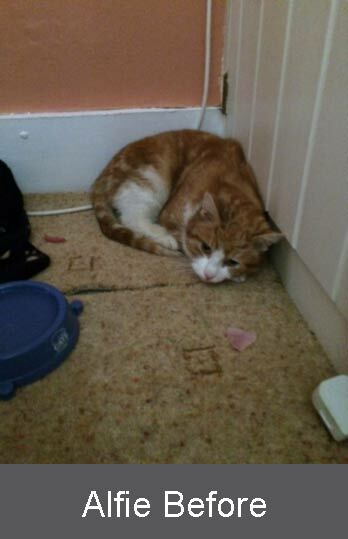 Alfie was a large ginger tom who came in as a stray when he was about five years old. He was so terrified when he arrived he tried to jump head first behind a cabinet of draws but was so big he got stuck half way, resulting in his bottom half wiggling in the air. Once he had been pulled out, he then hid behind the cabinet which became his refuge. He would hiss when anyone entered the room and wouldn’t move from his hunched up and terrified sitting position. He would only move around the room at night when the house was still. His fosterer, Beth, sat quietly on the floor beside him and gently read out loud from the book she was reading, to get Alfie used to her presence and her voice. A few days later, Beth was sitting reading to him and he popped his little head out from behind the cabinet and got straight on her knee. From then on he wouldn’t leave her side. She introduced him to the rest of the room and he would go and explore but then panic and run back and sit on her knee before building up the confidence to go and check out another corner. Soon, he would sit on anyone’s knee and was the friendliest cat you could ever meet. When a young man came to view him, Alfie snuggled on his lap and his new owner fell for him straight away. 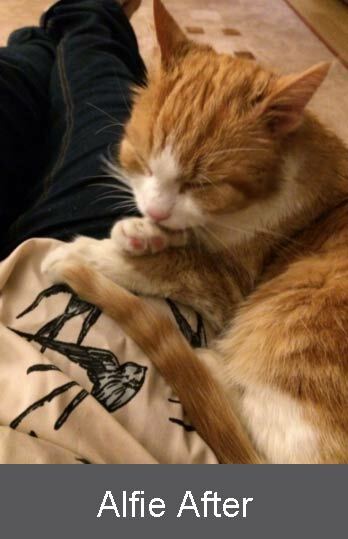 Alfie’s been in his new home for over a year now and the last we heard loves to sit on his owner’s lap so they can watch the football together! Seeing cats go from living outside and being terrified of humans to cuddling up, safe and sound and happy in a new home is a very special experience and is just part of what makes fostering such a wonderful thing to do.